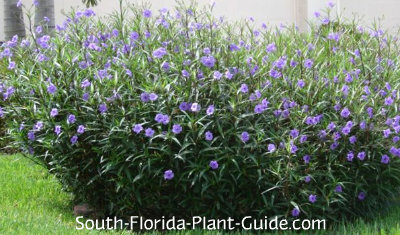 Highly decorative ruella, or "Mexican Petunia," produces endless violet-purple flowers that attract butterflies. Looking like a cross between an ornamental grass and a flowering shrub, this hardy plant flowers every day when placed in a sunny location. The petunia-like blooms each last only a day - but are replaced the next with more blossoms. 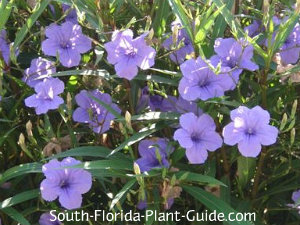 A popular favorite in South Florida landscapes, this pretty shrub spreads and can be invasive. Plant where solid edging contains the plant or regular maintenance controls the spread. AVOID placing near areas like wetlands or preserves. The showy purple color of the blooms works with almost all other landscape colors, and the plant's upright stems spilling over with long, thin leaves create an informal and even naturalized look. 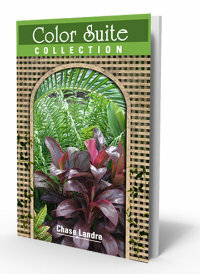 There is a dwarf variety that can be used as a groundcover. Both varieties attract butterflies. This plant is a fast grower that can quickly reach 3 feet tall. It needs full to partial sun to flower profusely. If planted in more shade, the plant will travel to get more sun. These evergreen shrubs are salt-tolerant and cold hardy, growing anywhere in Zones 9B and 10. Add top soil or organic peat moss to the hole when you plant. You may also want to add water-retaining crystals, pre-swelled before planting. See Watering for more details. Water is this plant's only issue. It likes it...a lot. 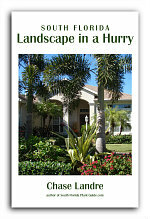 This is not a drought-tolerant shrub, so be prepared to provide regular irrigation. These shrubs can even handle "wet feet," growing in areas that are slow to drain. To mix a moisture-loving plant like this with other shrubs that like it dryer, using water-retention crystals for certain plants will keep everybody happy. Trim back whenever you like. Occasional trimming keeps these plants bushy and full. You may have to pull up stray shoots that pop up where you don't want them. 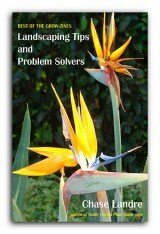 Fertilize 3 times a year - once each in spring, summer, and autumn - with a good granular fertilizer. Plant 3 feet apart. Come out from any structure 2 to 3 feet. These shrubs will outgrow any container in no time, so planting in the ground is your best option. Warning: You may have to work to keep it where you want it. 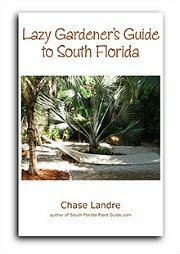 COMPANION PLANT SUGGESTIONS: Bamboo, wax myrtle, variegated arboricola, snowbush, star jasmine, plumbago, croton, and thryallis.